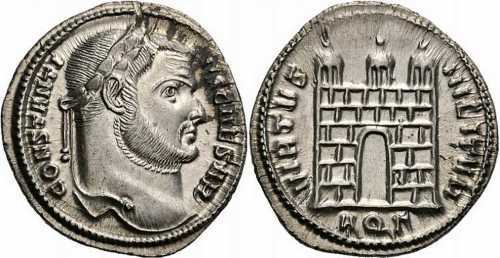 CONSTANTI-NVSCAESAR [CONSTANTINVS CAESAR]; head r., laur. VIRTVS-MILITVM [VIRTVS MILITVM]; three-turreted camp-gate, open, without door. AQΓ in exergue. UNLISTED FOR RULER. RIC lists this issue only for Maximian Herculius but erroneously assigns it to the Group III on p. 322. See CORRIGENDA, VOL. VI, p. 322. Coin should be listed after AQUILEIA 17b. Argenteus. Weight 3.26 g. Coin sold on Nomos auction 3 (lot 236) in May 2011 for CHF 3,000.